Overview - They are the voices behind the greatest Rock, Pop and R&B hits of all time, but no one knows their names. Now in this award-winning documentary, director Morgan Neville shines the spotlight on the untold stories of such legendary background singers as Darlene Love, Merry Clayton, Lisa Fischer, Judith Hill and more. These are the triumphs and heartbreaks of music's most unsung talents, featuring rare behind-the-scenes footage, vintage live performances, and interviews with superstars Bruce Springsteen, Mick Jagger, Bette Midler, Sting, Stevie Wonder, Chris Botti and Sheryl Crow. Short Film: The Buddy System. Our eyes are almost always pulled toward the dazzling allure of the spotlight -- but talent doesn't just exist at center stage. Whether we realize it or not, hidden gems often rest just toward the fringes of our view, out on the periphery of fame, and though we may not know their faces or their names, we surely know their soul lifting voices. Aimed at highlighting the all too frequently marginalized and anonymous background singers who expertly bolster and complement some of music's biggest names, the documentary film '20 Feet from Stardom' reveals an entire world of talent and artistry that many remain sadly unaware of. Filled with fantastic songs, classic performances, and enlightening interviews, the movie is an enjoyable and surprisingly emotional tribute to some of the music industry's most overlooked treasures -- finally giving their stories the attention they deserve. Using a mixture of newly conducted interviews, fly-on-the-wall recording sessions, and archive performances, the director traces the history of the background singing profession and spotlights several notable musicians who helped define the art form. Throughout it all, the emphasis is mostly placed on the female African American community's contributions, with the majority of the runtime dedicated to the lives and careers of veteran performers like Darlene Love, Merry Clayton, Lisa Fischer, and Claudia Lennear, and relative newcomers like Judith Hill. Famous musicians such as Mick Jagger, Bruce Springsteen, Sting, and Bette Midler are also weaved in, sharing stories about their experiences with the featured background singers. Early segments economically fill us in on the basics of background singing and introduce us to the doc's likeable ensemble, offering a nice mixture of personal anecdotes and vintage performances. 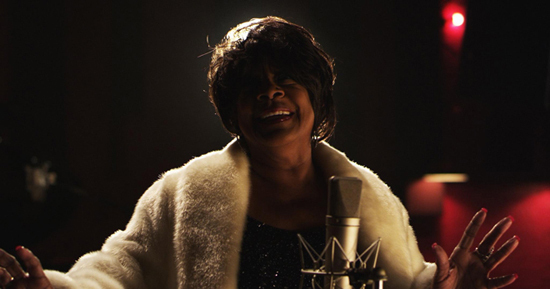 The singers have all worked in a variety of styles ranging from classic rock to pop and gospel, and each background performer has collaborated with an eclectic collection of recording artists, packing the film with great songs and live renditions from The Rolling Stones, Joe Cocker, George Harrison, Luther Vandross and many more. And while the musical numbers are all great, the real meat of the doc comes from the participants' personal stories, detailing their career paths, successes, failures, and feelings about stepping away from the spotlight to take supporting roles. This examination of the ins and outs of background singing proves to be surprisingly interesting, exposing the art form's unique qualities while expanding upon the chameleon like adaptability that the singers are required to perfect and the importance of finding harmony with each of their leads' distinct styles. Anecdotes related to the singers' collaborations with famous stars are all very entertaining -- the story behind Merry Clayton's involvement in the Rolling Stone's famous track "Gimme Shelter" is especially amusing -- but it's actually the documentary's latter portions that end up being the most revealing and affecting. It's in these segments that director Morgan Neville really starts to find the film's overarching voice, tackling the sometimes heartbreaking setbacks and stumbling blocks several of the background singers have had in their dreams to become solo artists. Darlene Love's frustrating story about hearing her famous holiday hit "Christmas (Baby Please Come Home)" on the radio of her employer while working as a maid is particularly telling -- and the trials and tribulations that each woman recounts ends up weaving an interesting expose of the music industry's fickle and harsh tendencies. With that said, the documentary is not without some issues. The film's initial stretches lack a bit of focus and these opening portions are filled with an overabundance of compliments lobbied at the doc's participants, making the first sections feel like little more than promotional fluff. Thankfully, the more the runtime goes on, the deeper the filmmakers delve, but certain spots still come across as a bit superficial. Likewise, the movie's shooting style can seem over-produced and manipulated at times, making some interviews and recording sessions come across as slightly affected and stagey. Of course, these flaws are all rather small, and the film's ultimate examination of its subjects and topic is quite solid and engaging. More than just a thoughtful, entertaining, and insightful look into the world of background singing, '20 Feet From Stardom' also offers a genuinely emotional commentary on the highs and lows of showbiz dreams and aspirations, chronicling the unfettered passion and disappointment that many singers are forced to bear. Certain portions can feel a little shallow and calculated, but the runtime eventually finds a meaningful voice full of amusing and eye-opening anecdotes and great musical performances. A heartfelt celebration of some of the industry's most shamefully overlooked talents, this is a bittersweet but ultimately crowd pleasing tribute to music and singers -- finally putting faces and names to many voices that have gone anonymous for far too long. 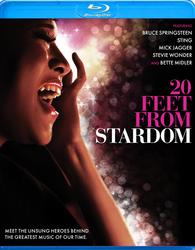 Anchor Bay brings '20 Feet from Stardom' to Blu-ray on a single BD-50 disc housed in a keepcase. After some skippable trailers, the disc transitions to a standard menu. The release is region A coded. The movie is provided with a 1080p/AVC MPEG-4 transfer primarily in the 1.78:1 aspect ratio. Though some of the archive footage varies in quality, the new HD material is sharp and nearly pristine, offering a very pleasing image. The digital source for the newly recorded material is nicely rendered with only some fleeting signs of minor artifacts. Some shimmering, noise, and faint signs of compression are noticeable in isolated instances, but the majority of the image is clean and problem free. Detail is strong, giving the interviews and fly-on-the-wall recording sessions a glossy, cinematic quality. Colors are rich but not over saturated, and contrast is nicely balanced with natural whites and deep black levels. With that said, the archive footage does vary in quality and showcases obvious signs of age, and a few clips appear to come from low grade digital sources. There are some negligible artifacts here and there, and the older clips look understandably rough, but the majority of the video is impressive with strong clarity and depth. The film is presented with an English DTS-HD MA 5.1 track and optional English SDH and Spanish subtitles. Filled with an exceptional decades spanning collection of music tracks and performances, this is a fantastic mix that envelops the audience in crisp, full-bodied sound. Dialogue and narration are clear and well prioritized throughout with no balance issues to speak of. Despite the film's documentary nature, the soundscape is actually relatively immersive, spreading appropriate atmospheric sounds like traffic throughout the speakers. The real focus here is on the music, however, and thankfully the tracks come through beautifully. Some of the older recordings and archive performances do reveal a few age-related issues, but the new recording sessions and recent stage shows all sound phenomenal. Dynamic range is wide and distortion free, delivering clean highs, crisp mids, and deep lows. Likewise, the songs carry a spacious presence with strong fidelity and great separation, filling the room with music. Packed with a great selection of fantastic rock, pop, and gospel songs, '20 Feet from Stardom' is a genuine audio showcase. For a documentary, this is a truly standout mix. Anchor Bay has put together a strong selection of supplements, including deleted material and a Q&A with the filmmakers. All of the special features are presented in 1080p with Dolby Digital 2.0 sound and optional English subtitles, unless noted otherwise. Deleted Scenes (HD, 29 min) - 12 deleted scenes are viewable separately or together. Most of the material is dedicated to more interviews and backstory for a few participants who were mostly marginalized in the final cut, including Jo Lawry and Judith Hill. The excised scenes also touch upon more anecdotes from the background singers' careers, and a few more recording sessions and performances (particularly from Judith Hill). The Buddy System (HD, 9 min) - This is a short film/featurette that discusses the deep sense of community/friendly competition that permeates throughout the background singing world. Times Talks: Q&A with Darlene Love, Merry Clayton Lisa Fischer & Director Morgan Neville (HD, 29 min) - Presented in 1080i, this is a Q&A with the film's cast and director. The group discusses the amusing inspiration behind the documentary, finding the film's story, the evolution of the background singing art form, and other miscellaneous tidbits from their careers. All of the participants seem to be genuinely good friends and the gang joke around well together. The session ends with a quick gospel performance from the three singers. 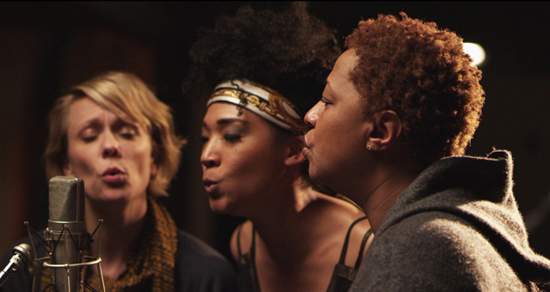 '20 Feet from Stardom' is an enjoyable and ultimately emotional documentary that shines a spotlight on the world of background singers. Through their dreams, successes, and failures, the director offers a fitting examination of showbiz passion and a crowd pleasing celebration of musical talent. On the technical front, the disc's video transfer is good and the audio mix is fantastic, offering a great selection of songs. The included deleted scenes and Q&A expand upon the film nicely, giving viewers some more anecdotes and performances. This is a very nice disc for a well made documentary. Recommended.